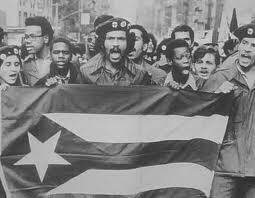 The young ones, Jimmy, whose uncle was a leader of the Young Lords, and Malik, a “Panther cub,” are orchestrating a reunion of the former revolutionaries, ostensibly to see the video at an art gallery. In fact they are tricksters, using their new-fangled technological devices to catch their elders in their most vulnerable moments. They are engaged in creating the theatre we see. The play takes me back to the certainties of the far left in those years—the righteousness. I remember how we hated LBJ. 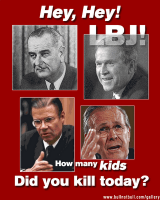 “Hey, hey LBJ, how many kids did you kill today?” LBJ looks different now. His support for civil rights, his “War On Poverty” looks wildly progressive in our current political environment. I can admire his political genius retrospectively, understand how he got caught in a wrong war; I see him now as a complex tragic figure. I never was a member of the hard left but I do remember sharing the messianic fantasy that “Come the Revolution” this nasty, prejudiced, murderous, world would be transformed—swords would be beaten into plowshares. Nothing turned out as we expected. This was painfully true for the aging revolutionaries of Party People. The play thrusts us into the unbearable in many forms—the angry splits between factions, whose backbiting and sniping continue to this day; the presence of the widow of a policeman who was shot during a demonstration—she holds an opposite point of view; the sense of failure, personal and collective—is any one better off now? the children? the schools? We hear whispers of “traitor.” People are still in a rage with each other, for good reason it turns out. Terrible things were done by those on both sides—unforgiveable betrayals, unredeemable guilt. Solias, Malik’s Black Panther father, who spent most of Malik’s childhood in jail, is a powerful figure—a well muscled, bald headed African American with a deep voice. He is played by the unforgettable Peter Macon (who also plays a searing Achilles in the Oregon Shakespeare Festival's Troilus and Cressida). Solias is a sympathetic figure, prowling the metal stairs and bars of the set until the terrible truth is revealed—he was an informer for CoIntelpro, the FBI's secret effort to neutralize political dissidents. It was his ticket out of jail. He is indeed the traitor the chorus of aging revolutionaries hisses about. Party People is relentless in its truth telling. It is a Bardo realm in which aging revolutionaries review their lives, face their past, worry about their legacy. We in the audience begin to understand that these are traumatized senior citizens, stuck in ancient animosities, guilty secrets, unrequited injustices, fractured lives. The elders are disappointed in young Jimmy and Malik—they are not radicals, they are not political. We, however, are given a glimpse of hope in these young men, who argue that their work—essentially the theatre piece we have been watching in a theatre in the round, which thrusts us into the action—is an example of the use of media to transform consciousness. It worked for me. 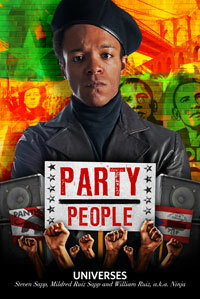 I haven’t stopped thinking and feeling about Party People. 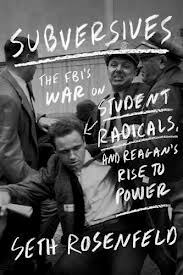 As I was musing about Party People I happened to hear a radio interview on NPR’s Forum with Seth Rosenfeld, the author of Subversives: The FBIs War on Student Radicals and the Rise of Reagan. Rosenfeld tells the shocking story of the FBI’s infiltration into the Black Panthers as well as the Free Speech Movement and the Vietnam Day Committee. I was a student at Berkeley in those years, and I joined the strike in Sproul Plaza; I was moved by Mario Savio’s eloquent protest against “the machine.” I was also involved with the Vietnam Day Committee— protesting the Vietnam War. My then husband and I began hearing a strange tapping sound on our phone. We assumed we were being tapped by the FBI and watched what we said. In later years I wondered were we paranoid? Apparently not. Rosenfeld sued the FBI for release of documents concerning Richard Aoki—a Japanese American known on the left for his activism and for being a founder of the ethnic studies movement. He was a beloved and revered figure, a professor at a community college and a guidance counselor. He committed suicide in 2009. According to Rosenfeld, Aoki’s family was interned in a concentration camp during the war. He was a conservative teenager—went to Berkeley High School a few years before I did—and while still very young was approached by the FBI who asked him to help them find communists in Bay Area student radical groups like the Young Socialist Alliance. 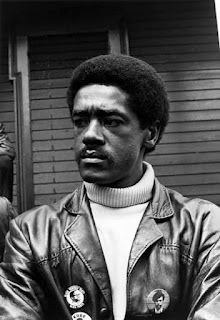 Aoki got involved in various left wing groups, was befriended by Bobby Seale and Huey Newton and was involved with them in organizing the Black Panthers. He provided them with guns. Rosenfeld does not know whether he did that at the behest of the FBI or whether it was his own idea. Certainly it had terrible consequences for the Panthers who were shadowed by gun violence. Rosenfeld interviewed Aoki in 2007. Aoki denied being an informer, but made a terse, haunting statement about his political history: “It’s complex. Layers upon layers.” Aoki left the Bureau in the early ‘70s. I imagine he must have lived in a hell like that depicted in Party People, Solias’ hell in particular—the hell of having betrayed those he was closest to, for reasons that at the outset must have made good sense. As a young man Aoki was a soldier. He was patriotic. He probably wanted to help his country. 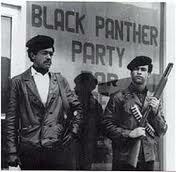 I imagine he got caught up in the fervent fever of the ‘60s and became a radical himself. Yet there was still his informer side, even after he left the FBI. Who could hear his whole truth? Who could understand and forgive him? What if he spent the last 40 years of his life doing good works, and still could not expunge his terrible guilt? Solias and Aoki are tragic figures. They remind us of how terrible life, fate and politics can be—how individual lives can get caught up in an undertow, picked up by a wave, and smashed against the rocks of history. Most Americans—the 99%—got caught in the undertow of the financial crisis that began in 2008. Many have been smashed against the rocks. The election of 2012 is filled with their suffering and their rage. The campaigns are being fought against the backdrop of a fierce zeitgeist—global economic and environmental crises, tyrants who murder their own citizens, young revolutionaries changing the world, reactionaries who deny climate change, who would dismantle the New Deal and repeal Women’s Rights. Thomas Singer: The Presidential Elections 2012: Surfing the Emotions and Complexes of the Collective Psyche. Richard Stein: Love in the Time of Cacophony: An Introvert’s Guide to Political Extremism. Naomi Ruth Lowinsky: Clinging to the Axis Mundi: The Muse of Politics. Richard Tarnas: Cosmos, Psyche and Polis: An Archetypal Astrological Perspective on Our Time.